...I was meaning how well it protected the cabin during such an accident. Its a DB :P but I took it out one night on highway 9 and went down the cliff. Rolled down a good 100 feet. Walked out with 2 stitches. I'm lucky as hell. 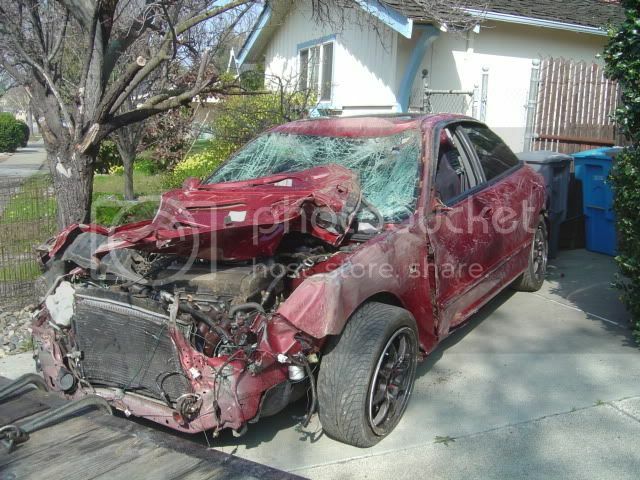 cage was never put in lol, it came in 3 days after the accident. Well, at least he was able to sell it/use it for something else. It would've have done much in his situation. Not true. Almost all Si models have the motors built in Japan, then they are assembled here. Several of the Si models are assembled in the UK. My 05 Civic Si is 60% Japan, 40% UK. Everything was made in Japan and the car was assembled in the UK. Thanks for participating though. 91 crx if anyone is interested, check out the auto classifieds. another gutless 4banger here. lol jk. i would like e46 m3 or m5 in the future. *that red FC is badass!!!! ^ ahaha freakin savage man....!!! Motorcycles: are the one with two wheels right? Just a peak of what's parked next to my truck. You gotta learn how to ride, before you ride to learn. ^ahaha TUAN!!! youre my neighbor man! You were at the last JDMtheory, weren't you?